Who won the current round of negotiations regarding whether to extend the Bush tax cuts? That is the question currently being debated by the punditocracy. It is also the wrong question. Indeed, many of the assessments regarding the tax deal negotiated by President Obama and members of Congress earlier this week reveal a fundamental misunderstanding regarding the nature of presidential power as exercised in the legislative process. At the center of debate is a Senate bill that would extend the so-called Bush tax rates for two years; extend unemployment insurance for 13 months, cut payroll taxes, reinstitute the estate tax at 35% (with a $5 million exemption) and offer several other tax breaks to individual tax payers and businesses. The cumulative cost of this legislative package would be about $858 billion, with about $801 billion of that in the form of tax breaks. This compares, for example, to the approximately $800 billion price tag of last year’s economic stimulus. Predictably, liberals blasted the President for caving to Republicans and reneging on still another campaign pledge – this time his promise not to renew the tax cuts for those earning more than $250,000, and for accepting a lower estate tax rate and higher exemption level than what Democrats wanted. Much better, they argued, that the President draw a line in the sand and threaten to veto any bill that extended the Bush tax cuts, even if it meant no bill and a tax increase on all taxpayers beginning January 1. Most likely, they argued, a veto threat would force Republicans back to the bargaining table to make more concessions. Conservatives, including a leading Tea Party group, are similarly dismayed, but for the opposite reason: they argue that the bill is still another budget-buster that will increase an already historically high deficit while providing little actual economic stimulus. Taken as a whole, they argue, this legislation is a very good deal for Obama and Democrats. This electoral calculus is a useful reminder that, contrary to the spin of armchair pundits, negotiations between the President and Congress can rarely be evaluated on the basis of the immediate legislative outcome. Pundits (and some political scientists) too often evaluate these interactions as if they are a one-time, zero-sum game, with clear-cut winners and losers. This is almost never the case. In this instance, Obama and Republicans both made sacrifices to achieve crucial policy objectives, and they did so knowing full well that this was not the end game. All these choices must be evaluated in terms of what happens in 2012, and with the understanding that they will all be revisited shortly thereafter. Of course pundits on both sides of the ideological aisle are free to urge their political leaders to stand on principle, consequences be damned. They do not have to worry about the consequences if their calculations are wrong, or if no deal is struck. Alas, those at either end of Pennsylvania Avenue do not have this luxury; they understand there will be significant repercussions from a failure to make a deal. The risk of standing on principle is that nothing gets done, taxes go up, and unemployment benefits run out. Moreover, Republicans are going to be in an even stronger bargaining position come January, when the new Congress is sworn in. These deadlines created an incentive to craft a deal – one in which there are no clear winners and losers, but in which everyone gives up something to get something else. And that is almost always the case when it comes to making difficult decisions – Congress does not act until the alternatives of not acting seem more costly. Did Obama give up too much, too soon? What were the alternatives and what were the risks associated with each? Presidential power, Richard Neustadt famously wrote, is the power to persuade. And persuasion means getting others to do what you want them to do by making them see that it is in their interest to do so. That usually requires bargaining and compromise. Neustadt’s words are frequently cited, but less frequently taken to heart by pundits and even political scientists. Bargaining between the President and Congress is a repeated game played out under conditions of limited information and uncertain outcomes, in which the choices one makes today must be evaluated in part on the impact they have on one’s ability to achieve objectives down the road. No vote is made in isolation, and rarely are there obvious winners and losers. This deal is no exception. House Democrats may be able to tweak some of the details as laid out in the Senate version, such as changing the estate tax rates, but in the end this bill will pass in a form that will make party purists on both sides unhappy and which will have no clear winners or losers. In so doing, it will also remind us once again of the difference between governing and “pundicating” – those in charge must deal with the consequences of their choices (or lack thereof), while pundits can move on to new punditry. Needless to say, many readers disagreed. If there was one aspect of Obama’s presidency that surely would differ from Bush’s, it would be his handling of foreign relations, particularly as they impacted civil liberties at home. For many Obama supporters, the promise to reverse the Bush era policies on interrogation, military commissions, rendition and prisoner detention formed the foundation of his promise to be a “change” president. It is still far too early in the Obama presidency to come to any final conclusions, of course, but not too early to assess my claim that, contrary to what many expected, Obama’s foreign policy will not significantly differ from Bush’s. 1. Closing Guantanamo Bay prison: During the campaign, Obama criticized the use of Guantanamo (Gitmo) to hold enemy combatants for extended periods of time, arguing that it became an unwelcome symbol of the Bush administration’s willingness to violate accepted international norms for treating prisoners. In his second day as president Obama issued an order to close Gitmo within a year. As I have long taught my students, however, a president’s executive orders carry very little weight unless they are in accord with the preferences of (or not actively opposed by) Congress. Although Obama’s executive order met with initial bipartisan congressional support, there was some concern that Obama had not yet adequately addressed what to do with the detainees there. That concern became a full-fledged political problem for Obama within the last week when an overwhelming bipartisan majority of Congress signaled their opposition to closing the prison until Obama comes up with a plan for dealing with the roughly 240 individual still held there. Two days ago, by a vote of 90-6, the Senate denied Obama’s request for $80 million to close the prison. That vote came on the heels of similar vote in the House last week. The problem, from Congress’ perspective (among both Democrats and Republicans) is the political cost of relocating these detainees to mainland prisons – no one wants to accept suspected Al Qaeda and Taliban terrorists in their backyard. The issue is further complicated by the leak of an unreleased Pentagon report that estimates that about 1 in 7, or roughly 70 of the 534 detainees already released from U.S. detention facilities including Gitmo are now engaged in terrorism or related acts. Understandably, politicians are leery of being accused of releasing someone who may perpetrate the next 9-11 attack. Bush, you will recall, also advocated closing of Gitmo, but not until the cases of those held there were disposed through trials by military commissions and/or an alternative location for holding detainees could be found. We see, then, that Obama is discovering what Bush realized: that Gitmo appears to be a horrible choice for holding enemy combatants – except when compared to the alternatives. It is one thing to say you will close Gitmo – quite another to do it. Because Obama made closing Gitmo a symbol of change, I do not doubt that in the end he will follow through on this promise. But it will require the expenditure of tremendous political capital, and will likely not occur on his preferred timetable. 2. Ending the use of certain “enhanced interrogation procedures”, such as waterboarding, that many believe constitute torture. Obama also issued an executive order on his second day in office requiring that the Army field manual be used as the guide for terrorism interrogations, thus apparently ending the Bush-era practice of waterboarding prisoners. As you’ll recall that technique was used, sometimes repeatedly, on at least three of the several hundred enemy noncombatants captured during the war on terror. Despite his belief that waterboarding is torture, Obama has repeatedly said that he will not pursue charges against anyone who used this or similar interrogation techniques, and he has opposed calls from members of his own party and from the netroots to investigate the use of these practices. One reason for his reluctance to do so may be his realization that leading Democrats – as indicated by the recent controversy regarding Nancy Pelosi – may have tacitly endorsed the use of such techniques. 3. Rendition: At the same time that he outlawed waterboarding, Obama also appeared to establish a potential loophole by allowing the continuation of rendition, a policy that allows the CIA to capture suspected terrorists and hold them for short periods in jails in other countries. Although Obama’s executive order states that: “(a) CIA Detention. The CIA shall close as expeditiously as possible any detention facilities that it currently operates and shall not operate any such detention facility in the future.”, it also declares that “(g) The terms ‘detention facilities’ and ‘detention facility’ in section 4(a) of this order do not refer to facilities used only to hold people on a short-term, transitory basis.” Critics argue that this simply allows the CIA to oversee the use of enhanced interrogation techniques by third parties on captured enemy combatants before transferring them to U.S. facilities – exactly the policy the Bush administration was accused of employing. 4. Military Commissions: In a decision that deeply disappointed civil libertarians, Obama decided last week to revive the use of military commissions first established by the Bush administration, and later ratified in revised form by Congress, to try some of the detainees currently held at Gitmo. Obama has promised to build in more safeguards, including restrictions on the use of information obtained through torture, to protect the rights of those enemy combatants who will be tried using military commissions. But he has accepted the Bush argument that, as enemy combatants, these detainees cannot be tried under regular civil or military courts. This despite saying during the campaign that “It’s time to better protect the American people and our values by bringing swift and sure justice to terrorists through our courts and our Uniform Code of Military Justice.” Upon reviewing the policy, however, Obama has apparently agreed with Bush that some detainees simply cannot be tried through these other avenues. 5. Iraq withdrawal. I’ve blogged previously on this issue, so won’t go into detail except to say that increasingly it appears that U.S. combat troops won’t be leaving Iraq by the date or in the numbers that Obama hoped for during the campaign trail. It now appears that the U.S. will miss the June deadline for a complete withdrawal of combat forces from Iraqi cities, and there remains significant debate whether Obama will even be able to hold to the Bush-negotiated deadline of removing all combat troops by the end of 2011. It may be that in order to appear to meet the deadline, the Obama administration will have to fudge the definition of “combat soldiers” in a way that makes it appear that all such soldiers have been withdrawn. His own military commanders continue to make the case for slowing the withdrawal in order to make sure that gains from the surge do not dissipate when U.S. troops withdraw. How can this be? What explains Obama’s reluctance to reverse the major polices underlying Bush’s War on Terror? It is easy to condemn Obama for failing to fulfill what many, particularly Democrats on the Left, thought he would do as president. The reason he has not done so, however, is not that he was not sincere when making his campaign promises to change the Bush policies governing the war on terror. Instead the explanation is rooted in a point I return to again and again, but one that bears repeating: campaigning is not the same as governing. When he became president, he assumed a responsibility, and a perspective on politics, that is simply unimaginable on the campaign trail. More than any single individual in our nation, it is the President who bears the burden of protecting the security of our country. That vantage point is unique among elected officials; it is not shared by anyone else, and it permeates everything presidents do. This is not to say that presidents are more powerful in foreign policy – in a later post I’ll make the claim that their foreign policy powers are actually quite weak. But they do bear a sense of responsibility that Congress, as a collective body, simply doesn’t feel as acutely. Harry Truman was once interviewed about his decision to go ahead with the development of the H-bomb. How could he justify the decision? He replied that he felt it was his responsibility, as president, not to tie the hands of his presidential successors – he owed it to them to make sure they had every tool available to protect the country. His first thought, then, was of the individuals with whom he shared the office of the presidency. Invariably, when presidents are faced with a major foreign policy crisis, the first person they consult, if possible, is a former president. And why not? No one else really understands what they are going through. Let me be clear here. I do not mean to denigrate the importance of the symbolic acts Obama has taken so far; the banning of waterboarding, at least directly by the U.S., and the promise to close Gitmo, are significant steps in signaling his intention to reverse, at least in name, the most controversial of the Bush-era policies. But it is also the case that substantively his policies to date have proved far less of a reversal of Bush’s policies than Obama’s supporters hoped. Note that Obama does not lack the authority to fulfill those expectations – he could have ended the use of rendition, not revived military commissions, and directed his military commanders to meet his 6-month timetable for withdrawing all combat forces from Iraq. Despite the media focus on Cheney’s claim that Obama has weakened U.S. security, the plain fact is that most leading Republicans support most of Obama’s policies discussed above precisely because they have not substantially reversed Bush’s. Put another way, if John McCain had been elected president, it is probable that we would be seeing almost the same policy steps undertaken that Obama has pursued to date. It is easy to criticize Obama – and anyone who follows the netroots realizes he has angered the Left with his failure to reverse Bush’s policies. But that criticism, I think, is misdirected. The reason why Obama has largely continued Bush’s foreign policy is because he perceives the same threats, and operates under the same constraints, as Bush did. Safeguarding the nation is not, in the end, a partisan issue. It transcends pure politics, even though presidents cannot ignore politics in pursuing this overriding goal. It is why Obama attacks the symbols of Bush’s policies without significantly changing their substance. The surprise is not that President Obama continues Bush’s foreign policies in the main – it is that anyone ever thought it would be otherwise. “Our first goal is clear: We must have an economy that grows fast enough to employ every man and woman who seeks a job. After recession, terrorist attacks, corporate scandals and stock market declines, our economy is recovering. Yet it is not growing fast enough, or strongly enough. Jobs are created when the economy grows; the economy grows when Americans have more money to spend and invest; and the best and fairest way to make sure Americans have that money is not to tax it away in the first place. I am proposing that all the income tax reductions set for 2004 and 2006 be made permanent and effective this year. And under my plan, as soon as I’ve signed the bill, this extra money will start showing up in workers’ paychecks. Instead of gradually reducing the marriage penalty, we should do it now. Instead of slowly raising the child credit to $1,000, we should send the checks to American families now. How do you think the public who watched his speech reacted to that? Did they find his argument that taxes wouldn’t go up on his watch persuasive? Were they more inclined to support his economic policies as a result of the speech? Sure they were. Here’s the CBS “snap poll” gauging the audience’s views on Bush’s tax and economic policies before and after viewing his speech. Notice the decrease in the number of people who, as a result of watching Bush’s speech, now believe their taxes will go up – it’s almost a 30% change. DOES BUSH HAVE SAME PRIORITIES FOR NATION AS YOU DO? “Our nation and the world must learn the lessons of the Korean Peninsula and not allow an even greater threat to rise up in Iraq. A brutal dictator, with a history of reckless aggression, with ties to terrorism, with great potential wealth will not be permitted to dominate a vital region and threaten the United States. Twelve years ago, Saddam Hussein faced the prospect of being the last casualty in a war he had started and lost. To spare himself, he agreed to disarm of all weapons of mass destruction. For the next 12 years, he systematically violated that agreement. He pursued chemical, biological and nuclear weapons even while inspectors were in his country. Nothing to date has restrained him from his pursuit of these weapons: not economic sanctions, not isolation from the civilized world, not even cruise missile strikes on his military facilities…. And tonight I have a message for the brave and oppressed people of Iraq: Your enemy is not surrounding your country, your enemy is ruling your country. And the day he and his regime are removed from power will be the day of your liberation. The world has waited 12 years for Iraq to disarm. America will not accept a serious and mounting threat to our country and our friends and our allies. The United States will ask the U.N. Security Council to convene on February the 5th to consider the facts of Iraq’s ongoing defiance of the world. Secretary of State Powell will present information and intelligence about Iraqi’s — Iraq’s illegal weapons programs, its attempts to hide those weapons from inspectors and its links to terrorist groups. U.S. MILITARY ACTION TO REMOVE SADDAM HUSSEIN? Once again, among those who watched the speech, it elicited a jump in support – this time 10% – in favor of Bush’s policy to remove Hussein by military force. My point in revisiting the public reaction to Bush’s 2003 address to a joint session of Congress is not meant to justify Bush’s policy pronouncements on taxes, the economy or the use of military force to remove Hussein. Instead, I want to make two points that I think must be kept in mind as we assess the reaction among those who watched the Obama and Jindal speeches on Tuesday. If you believe the chattering class, the polling data indicates that Jindal’s career is over, while the response to Obama’s speech reflects broad public support for his policies. There are two problems with this interpretation of the polling results. First, the viewing audience for these speeches is not a random sample of Americans. 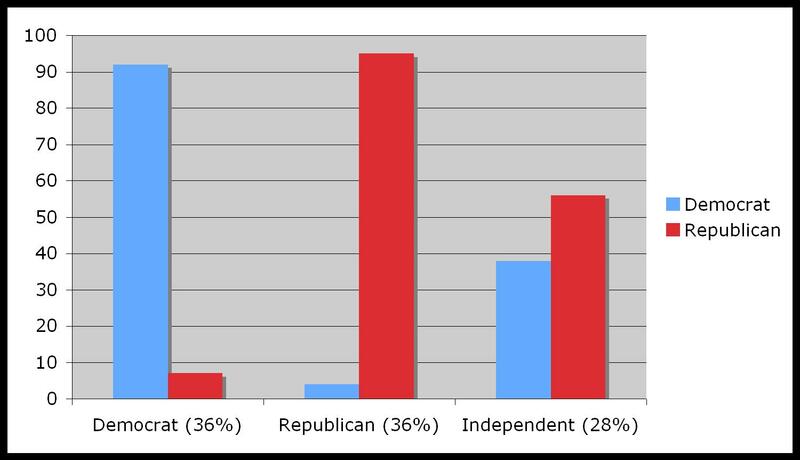 Instead, it is almost always weighted more heavily toward the president’s partisans. In Bush’s case, his speech was watched by an audience that was 8% more Republican than the public as a whole. Second, the pageantry and symbolism involved in a joint address to Congress can override, to a point, some of the viewing audience’s political predispositions, so that even those who are not naturally inclined to share the president’s political leanings may express support for his policies. The viewers think, “Here is a speech by our president, standing in our Congress.” A joint address, with all the pageantry and theatre, is a reminder of more enduring, less partisan symbols that define our nation. Presidents know this, and play to those symbols. Witness Obama’s use of “real people” stories to drive home his points, as well as references to the First Lady (who doesn’t like her?) and his signing autographs after the speech. The idea in invoking these symbols is to make the occasion rise above partisan politics. I could have pulled out almost any State of the Union speech to make these points, but I thought the Bush speech provided the most dramatic impact because of what happened in Iraq and to the economy while he was president. The lesson, I hope, is clear: you shouldn’t over interpret the public reactions, based on polling data, to major presidential addresses. They almost always elicit a short-term burst of approval for the president and the policies he enunciates, in part because of the sample bias inherent in the audience. If you are predisposed to support the president, you are more likely to watch his speech, and to register approval for what he says afterward. But it is also the case that even those in the viewing audience who are ideologically less inclined to support the president will tend nonetheless to suspend those inclinations and react favorably to a presidential address because of the symbolic aspect of the event. Presidents aren’t just political figures – they are also, in part, the embodiment of national sovereignty. That symbolic or affective aspect of their role is often what gets captured in respondents’ answers to polling questions. By the way – do you remember who gave the Democratic response to Bush’s 2003 speech, and how it was received? Of course you don’t. Locke, as most of you know, is now in line to become the next Secretary of Commerce. Take heart, Jindal! I thought you might get a kick out of this email I received from a former Middlebury College student, now working in Washington DC, who happens to be one of the four people who voted for McCain in that area. “I have to say, even though I ended up voting for the other guy, last Tuesday was an event that I’m going to remember for a very long time. It was totally unreal experiencing it here in Washington. When the networks called it for Obama as the western polls closed at 11 o’clock, the city, for lack of a better word, just exploded. I had been watching the returns in the U Street area with friends and we ended up walking down to the White House and then back up to U Street. I don’t know how familiar you are with the different DC neighborhoods, but U Street was where most of the upper-middle class black families in the city used to live. In 1968, it burned to the ground, and it is only within the past five years or so that the area has really started to recover. I remember driving through the neighborhood periodically when I was much younger and seeing boarded up buildings for blocks – and this was in the mid-90’s, almost thirty years after the riots. And in the next post I’ll begin to present exit poll data demonstrating why the historic symbolism of Obama’s victory will not necessarily translate into increased political clout.